TERMS; New lease is available at a rental of £4,750 per annum exclusive. Rates Payable Approx; £1166 – under SBRR 100% relief would be available SERVICE CHARGE; 2017 is approx. £405 per quarter. This covers the suites share of expenses for building maintenance, communal heating, cleaning and common areas the lift etc. It is paid quarterly in advance with the rent. Buildings Insurance for 2017 is approx £72 Electricity is charged on a proportional basis relating to the area occupied. Tenants will be liable for maintaining their offices in good decorative order. 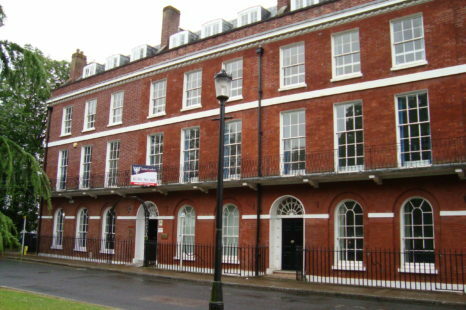 11-15 Dix’s Field is a period style office building, just off Southernhay by the Civic Centre. It is part of Exeter’s central business district, and is served by several large car parks, with the bus station in Paris St, and Central Station in Queen St, both nearby. Other tenants include The Bank of England, Hays & Blue Arrow Recruitment, The NHS and local CoWork space. OFFICE D is an individual room on the lower ground floor The building has central heating, a security entrance system and CCTV monitoring, a lift to all floors, ladies and gents w.c.’s on alternate floors with a ground floor disabled unisex toilet. There is also the use of a communal ground floor meeting room by arrangement.